Five years ago, I wrote about the unknown Holocaust in Ukraine. I was shocked to receive a flood of mail from young Americans and Canadians of Ukrainian descent telling me that until they read my column, they knew nothing of the 1932-33 genocide in which Josef Stalin's Soviet regime murdered seven million Ukrainians and sent two million more to concentration camps. How, I wondered, could such historical amnesia afflict so many? For Jews and Armenians, the genocides their people suffered are vivid, living memories that influence their daily lives. Yet today, on the 70th anniversary of the destruction of a quarter of Ukraine's population, this titanic crime has almost vanished into history's black hole. So has the extermination of the Don Cossacks by the communists in the 1920s, the Volga Germans in 1941 and mass executions and deportations to concentration camps of Lithuanians, Latvians, Estonians and Poles. At the end of World War II, Stalin's gulag held 5.5 million prisoners, 23% of them Ukrainians and 6% Baltic peoples. Almost unknown is the genocide of two million of the USSR's Muslim peoples: Chechens, Ingush, Crimean Tatars, Tajiks, Bashkirs and Kazaks. The Chechen independence fighters who today are branded as "terrorists" by the U.S. and Russia are the grandchildren of survivors of Soviet concentration camps. Add to this list of forgotten atrocities the murder in Eastern Europe from 1945-47 of at least two million ethnic Germans, mostly women and children, and the violent expulsion of 15 million more Germans, during which two million German girls and women were raped. Among these monstrous crimes, Ukraine stands out as the worst in terms of numbers. Stalin declared war on his own people in 1932, sending Commissars V. Molotov and Lazar Kaganovitch and NKVD secret police chief Genrikh Yagoda to crush the resistance of Ukrainian farmers to forced collectivization. Ukraine was sealed off. All food supplies and livestock were confiscated. NKVD death squads executed "anti-party elements." Furious that insufficient Ukrainians were being shot, Kaganovitch - virtually the Soviet Union's Adolf Eichmann - set a quota of 10,000 executions a week. Eighty percent of Ukrainian intellectuals were shot. During the bitter winter of 1932-33, 25,000 Ukrainians per day were being shot or died of starvation and cold. Cannibalism became common. Ukraine, writes historian Robert Conquest, looked like a giant version of the future Bergen-Belsen death camp. The mass murder of seven million Ukrainians, three million of them children, and deportation to the gulag of two million more (where most died) was hidden by Soviet propaganda. Pro-communist westerners, like The New York Times' Walter Duranty, British writers Sidney and Beatrice Webb and French Prime Minister Edouard Herriot, toured Ukraine, denied reports of genocide, and applauded what they called Soviet "agrarian reform." Those who spoke out against the genocide were branded "fascist agents." The U.S., British, and Canadian governments, however, were well aware of the genocide, but closed their eyes, even blocking aid groups from going to Ukraine. The only European leaders to raise a cry over Soviet industrialized murder were, ironically and for their own cynical and self-serving reasons, Hitler and Italian dictator Benito Mussolini. Because Kaganovitch, Yagoda and some other senior Communist party and NKVD officials were Jewish, Hitler's absurd claim that communism was a Jewish plot to destroy Christian civilization became widely believed across a fearful Europe. When war came, U.S. President Franklin D. Roosevelt and British PM Winston Churchill allied themselves closely to Stalin, though they were well aware his regime had murdered at least 30 million people long before Hitler's extermination of Jews and gypsies began. Yet in the strange moral calculus of mass murder, only Germans were guilty. Though Stalin murdered three times more people than Hitler, to Roosevelt he remained "Uncle Joe." The British-U.S. alliance with Stalin made them his partners in crime. Roosevelt and Churchill helped preserve history's most murderous regime, to which they handed over half of Europe in 1945. After the war, the left tried to cover up Soviet genocide. Jean-Paul Sartre denied the gulag even existed. For the western Allies, Nazism was the only evil; they could not admit being allied to mass murderers. For the Soviets, promoting the Jewish Holocaust perpetuated anti-fascism and masked their own crimes. The Jewish people, understandably, saw their Holocaust as a unique event. It was Israel's raison d'etre. Raising other genocides at that time would, they feared, diminish their own. This was only human nature. While today, academia, the media and Hollywood rightly keep attention focused on the Jewish Holocaust, they mostly ignore Ukraine. We still hunt Nazi killers, but not communist killers. There are few photos of the Ukraine genocide or Stalin's gulag, and fewer living survivors. Dead men tell no tales. Russia never prosecuted any of its mass murderers, as Germany did. We know all about the crimes of Nazis Adolf Eichmann and Heinrich Himmler; about Babi Yar and Auschwitz. But who remembers Soviet mass murderers Dzerzhinsky, Kaganovitch, Yagoda, Yezhov and Beria? Were it not for writer Alexander Solzhenitsyn, we might never know of Soviet death camps like Magadan, Kolyma and Vorkuta. Movie after movie appears about Nazi evil, while the evil of the Soviet era vanishes from view or dissolves into nostalgia. The souls of Stalin's millions of victims still cry out for justice. Harvard University’s National Resource Center for Russian, East European and Central Asian Studies (NRC) has developed a teacher curriculum unit that further explores the themes of the traveling exhibition. It is a three-day course intended for use amongst U.S. middle and high-school students. The unit, entitled, “GULAG: Soviet Prison Camps and Their Legacy,” includes chapters devoted to the creation and scope of the Gulag system, daily life in the camps, as well as the Gulag’s historical legacy. The curriculum includes first person accounts and artwork as well as class exercises and homework. If you are interested in receiving a curriculum unit, please contact the NRC at nrc@fas.harvard.edu, or feel free to download a PDF of the curriculum unit. At a recent Publishers’ Forum in Lviv a Ukrainian version of Jukka Rislakki’s book Vorkuta! GULAG Uprising, won an acknowledgement award of the Publishers’ Guild. The author is a Finnish journalist, non-fiction writer, political cartoonist. He was a guest of honor at the forum. Jukka Rislakki was born in 1945, in Kuusankoski, Finland. He has lived in Latvia for the past 20 years. He worked for the prestigious Finnish newspaper Helsingin Sanomat for more than 30 years, writing on history, pop culture, and ideology in the Baltic States. His wife is Anna Zigure, writer, translator, former Latvian ambassador to Finland and Estonia. In 2007, his best known analytical work on Latvia came off the presses in Finnish, then in English (“The Case for Latvia. Disinformation Campaign against a Small Nation”). He was awarded the Cross of Recognition in Riga on May 4, 2009, the day of restoration of independence of the Republic of Latvia, in recognition of his meritorious contribution to the international image of the republic. Jukka Rislakki’s book on the Vorkuta prison camp uprising is the first non-fiction publication dedicated to one of the biggest GULAG revolts. During the book launch ceremony in Lviv, Mykhailo Komarnytsky, founder and CEO of the Litopys Publishing House, noted that he had decided to publish a Ukrainian version of the book as a tribute to his father who had taken part in the Vorkuta uprising in 1953. Among those present were the sons of Yosyp Ripetsky from Ivano-Frankivsk oblast, one of the characters in the book who had died in October 2013. Volodymyr Viatrovych, head of the Ukrainian Institute of National Memory, took the floor to emphasize the special meaning of Rislakki’s book in revealing little-known pages in history. Taras Vozniak, chief editor of the Yi magazine, noted that Ukraine regrettably lacks scholarly research relating to Ukrainians who took part in the GULAG uprisings. The Ukrainian translation was done by Yurii Zub of Lviv, currently a postgraduate student at the University of Helsinki, author of a Finnish-Ukrainian idiomatic dictionary. In fact, Jukka Rislakki said that the Ukrainian version sounds even better than the original. Indeed, this non-fiction work is easy to read and is best described as a page-turner, even though the topic is markedly tragic. Rislakki’s book is about one of the biggest GUGAL uprisings, based on interviews with eyewitnesses and research papers that few Ukrainian historians have had access to. “Ukrainians and people from the Baltic States proved the most active participants in the uprising in the summer of 1953, after Stalin’s death, who paid a dear price for their resistance. I started working on the book ten years ago. I decided to write about a Finn who died during the revolt. As I worked on the book, I changed my mind and decided to write about all who took part in it. I learned a lot of new facts about the Ukrainians, that they constituted the majority of the GULAG inmates, that they were always the most active rebels among the GULAG inmates of various ethnic origins, with the Poles coming next,” said Jukka Rislakki. In his book one can learn from the story of the Finnish rebel, Eino Prukja, about Soviet repressions against the Finnish people. Such information is scarce in Ukraine, although we know that there were repressions. Reading about the uprooting of all that was Finnish in Karelia, about Finns being arrested in St. Petersburg simply because they are Finns, one immediately recognizes the same Soviet modus operandi in Ukraine, in the deportation of Crimean Tatars. There are numerous revolts in GULAG history. They varied in scale but had the same outcome: ruthless suppression. Three of them – in Norilsk, Vorkuta, and Kengir – proved the best organized and worst ones for the authorities, so that in the end it was decided to change the system of incarceration, revise some cases, and release a number of political prisoners. The new inmates served their terms under different conditions in 1960s-1970s, they could continue their resistance as human rights champions rather than armed rebels. There is more or less sufficient media coverage of the Norilsk and Kengir uprisings. The one in Vorkuta remains to be researched. The Ukrainians who were the most active participants have left little in print. The most important aspect of that revolt was that the inmates serving the longest terms, being treated the worst by camp authorities, demanded freedom rather than better working conditions. Moscow law-enforcement documents described the event at the time as “organized counterrevolutionary, anti-Soviet sabotage.” The political prisoners knew that the totalitarian authorities would punish them severely, but they refused to die as slaves. “Proud Ukrainians formed a solid team in the Vorkuta GULAG camp, they wholeheartedly hated the Soviet system; their patriotism and spiritual fortitude were amazing,” writes Jukka Rislakki. The uprising at maximum security Camp No.6 (known as RechLag or River Camp) at Vorkuta lasted from July 19 until August 1, 1953. The camp consisted of 17 zones with a total of 38,589 inmates, including 16,812 nationalists (10,495 Ukrainians, 2,935 Lithuanians, 1,521 Estonians, 1,075 Latvians, and 510 Poles). As political prisoners, they were exempt from amnesty after Stalin’s death. The revolt plan was carried out step by step, first as a number of strikes, on an almost daily basis, here and there in the prison camp. There were underground groups in RechLag, organized on an ethnic or community basis. The rebels had their headquarters tasked with monitoring stoolies, NKVD operatives, and camp administration. The HQ “officers” were not on the camp work team lists. Barracks No. 42 accommodated the “Bandera Headquarters.” Among the most active Ukrainian participants in the rebellion conspiracy were Yurii Levando, Fedir Volkov, Edward Buts, OUN UPA members Serhii Kolesnykov, Vasyl Hryhorchuk, Yosyp Ripetsky, Vasyl Zaiets, Petro Sobchyshyn, and Volodymyr Maliushenko. Lithuanians, Latvians, Estonians, and Germans had their own headquarters. In Zone Two, the Polish inmates were led by Kedzierski, ex-captain of the Polish army. On July 19, 350 inmates who had been transferred to RechLag from StepLag (Steppe Camp) in Kazakhstan and placed in another zone, refused to report for work. They demanded that the authorities abolish maximum security corrective labor camps under the interior ministry’s jurisdiction, penal servitude, and shorter terms under Article 58 of the Soviet Criminal Code [arrest and trial on charges of anti-Soviet activities as an “enemy of the people”], that no inmates be transferred to other camps before the visit of the communist party central committee’s official. The statement was signed by some 150 inmates. 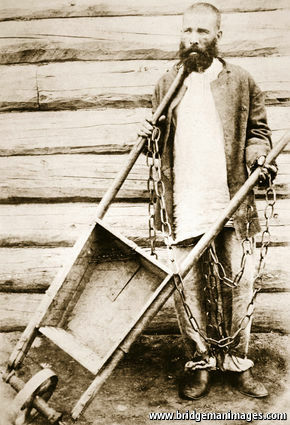 On July 22, as many as 1,500 inmates of Zone Two refused to report for work on first and second shift at Coal Mine No. 7. The next day there were 3,000 inmates on strike in that zone. The camp administration promised better working conditions (9-hour working day), that the ID numbers would be removed from their clothes. Now every inmate was to be addressed by first name and patronymic. They could write a letter a month rather than two letters a year, send money to their families, draw up to 300 rubles from the savings bank account each month. They were allowed visits by family members. An announcement to this effect was immediately made in the RechLag rebellious zones. Step by step the edifice of Putinist version of Russian history is starting to show itself, the ultimate creation of a ruler who is desperately trying to go down into history as a creator instead of a destructor. Over the past fifteen years we have repeatedly been offered a glimpse into the man’s mind, and every time the glimpse has been unsettling. Over the years, the short and stocky-built KGB agent from backwater GDR-times Dresden has shown himself as a revengeful, narrow-minded and empathy-lacking political leader who continues to believe in all the values that Andropov’s KGB instilled in him: power-politics, coercion and where needed brutal force, a ruthless attitude to ideological “diversion” and exalting the Potemkin Village that the USSR was and Russia continues to be. The sad issue for Putin is that he is in charge of a country that is not only a Potemkin Village, but also one that is built on corpses of the millions of people that were eaten up by the system and its hangmen and collaborators. Wherever you look in Russia you will find corpses, and many of them still lie hidden, close under the surface of the endless stretches of taiga and forests of Siberia. Russia’ history is by definition one of hardships, although in the West most people remain blinded by the other side of the story: the writers, poets, painters and other artists, the beauty of the Moscow metro… Stop! Wasn’t that one also built by forced laborers? Indeed, tens of thousands lost their lives doing so, including the engineers who suddenly became “enemies of the people”. Yet the happy Western tourists who flock to the metro only see the pretty lamps and marble, and look at statues of Bolshevik murderers without even knowing what their eyes are focused on. Putin set himself the impossible task of rebuilding the glory of Russia without any catharsis, without ever coming clean. Rather, those who dare to “slander” Russia’s (read: Soviet) past and are engaged in “anti-Russian (Soviet) agitation and propaganda” are all foreign agents who should be banned from public life and see their voices muted by the full force of Russian (Soviet) justice. Russia is in a collective state of denial, not realizing the horrible fact that all the nightmares of seventy-five years of Communism lie to a large degree on its shoulders, and that it bears a historical responsibility that is identical if not bigger than that of Germany. Sure, the Soviet regime found many collaborators in the countries it subjected to Soviet rule, from the Baltics to Central Asia, from the Caucasus to occupied Karelia. However, it is clear that Russians or Russia-based power formed the backbone of the regime. So when Russia embraced the historical legacy of the USSR it also embraced this not so pleasant legacy. So what to do with it? Putin has the answer, and it is typically KGB: you just rewrite it. You don’t deny, but you turn the murder of tens of millions people into a “tragic page” in the history of the heroic struggle of the Russian (Soviet) nation. In practice this means that you close the existing museum of the Gulag in Perm 36, and you have the organization “Memorial” – that like no other records the history of Soviet repression – branded as a “foreign agent”. You put everybody who deals with the issue the way you don’t like outside the law, and you respond by creating your own alternative. It is so simple, that only a KGB-mind could think of it. So here we are, a new Gulag museum opened in Moscow, a State organization and paid by the KGB-state that wants to commemorate its victims. It finds allies in the widow of Aleksandr Solzhenitsyn, the author of the momentous work “Gulag Archipelago” who, like Putin, believed in the historical destiny of the Russian people and the inviolability of Russia’s borders – the Imperial borders, for sure, the ones that include the Baltics, Finland, preferably also Poland, definitely Ukraine… Among the allies is also the American historian Stephen Cohen, already in the 1980s an apologist for the “peace-loving” Soviet regime and now one of Putin’s apologists. The original creator of the idea of the museum, Anton Antonov-Ovseyenko, son of a prominent Bolshevik who fell victim to his own regime, and who died without seeing his dream fulfilled, would turn around in his grave knowing that of all people it was Putin who stole his idea and turned it into another distasteful element in his quest to rewrite history. Putin has one powerful ally: the ignorance of Westerners, Western leaders included. Most forgot about the Soviet past, many were basically still wearing diapers when the USSR disintegrated. What do they know about the execution of 7 million Soviet citizens, the horrible deaths in the taigas of Siberia of some 14 million others, the at least 7 million Ukrainians killed in the artificial hunger of 1932-1933, and the millions of others who lost their lives while “contributing” to the biggest catastrophe in human history? While writing this I watch another parade on Red Square in Moscow celebrating the victory over Nazi Germany. I lost track of how many parades we had over the past years, and don’t even want to think how many are still ahead. I watch the glorification of battle, knowing full well that hundreds of families in St. Petersburg and elsewhere are in desperate grief over their lost ones, killed on the plane brought down as a result of another one of Putin’s “successful” policies. I see the troops marching in white winter-uniforms, and remember the 400,000 Soviet soldiers who lost their lives during the Russo-Finnish War of 1940, another of those useless battles wages by one of Putin’s great examples, Iosif Vissarionovich Stalin. And I wonder where this all is going to end. I am sure, however, of one thing: Putin has much more up his sleeve. We already know it will include the inauguration of a monument to victims of political repression, yet another disgusting situation where the hangman “honors” his victims after killing them. It will involve more military adventures, leading to soldiers losing their lives in “accidents” and families told to shut up or pay the price. And it will definitely lead to more suffering for the Russian people, and for those nations who happen to have the fate of living in their neighborhood. And Putin? Putin is probably admiring himself in the mirror, a mirror that distorts the image and makes him as big as he would like to be. The museum Perm-36 is the only building complex from the Stalinist Gulag still standing in Russia today. In the Soviet era, many dissidents found themselves between its walls: Vladimir Bukovsky, Sergey Kovalev, and hundreds of other political prisoners. For almost 18 years after the collapse of Communism, the building was independently operated as a museum by a nongovernmental organization. In 2014, however, officials decided to reclaim it for the state, seizing control from Perm-36. On March 2, 2015, after months of failed negotiations with the local government to keep the prison open as a public museum, Perm-36 announced its own dissolution. Meduza presents a photo series by Maxim Sher on this most unique museum. The Soviet Gulag was a massive system of forced labor camps. Throughout its history some 18 million passed through the prisons and camps of the Gulag. Under Stalin, labor camp prisoners became an important resource for the construction of many industries, including the nation's railways and roads, mining operations, and the timber industry. Millions suffered in the camps, many guilty of no crime. In the eyes of the authorities, a prisoner had almost no value. An unknown number well into the millions died in Gulag camps. Those who died of hunger, cold, and hard labor were easily replaced by new prisoners. The year 2009 will mark the 70th anniversary of the beginning of World War 2. Yet one aspect of Poland’s wartime history is hardly known to most people – the deportation, imprisonment, and other repression of the inhabitants of the Kresy, or Eastern Borderlands, on Josef Stalin’s orders, to Soviet slave labor camps and Gulags in Siberia, Kazakhstan and eastern Asia. Almost two million Polish citizens suffered this “Gehenna”. Many died in the camps from hypothermia, lack of nutrition, or diseases like typhoid or malaria. Others survived to join the Polish Forces under Allied command battling Nazi Germany in Africa and Europe, or to see out the war in refugee camps in the Middle East, Africa, India, New Zealand and Mexico. Most never returned to their fatherland because it was annexed by the Soviet regime after the war. The Kresy-Siberia Group is "dedicated to researching, remembering and recognizing the Polish citizens deported, enslaved and killed by the Soviet Union during World War Two". It was established by a number of survivors and their descendants to tell the stories of the "Polish Gehenna" to the world. We have an active discussion group, a website, memorial wall and online gallery containing thousands of photographs and documents posted by our members. However, our collection is getting very large and increasingly difficult to access – the information could be far better presented to the world. In addition, other historical sources of images and information, such as the Karta Centre in Warsaw, the Hoover Institution in California and the Sikorski Institute in London, also remain stored in archives and not as accessible as they could be for study and display. In the meantime, the last of the survivors are aging and dying out – and with them the memories and testimonies about their historic and heroic experiences. In the absence of a physical museum commemorating this history, our solution is to work with key partners to create a virtual museum on the internet and make it accessible to the world. Any discussion of Siberia is incomplete without an examination of its role in the history of Russia as a penal colony. Russian Tsars exiled many political opponents, as well as common criminals, to prison camps and remote villages in the Siberian vastness. Such exiles, many of whom were highly educated, helped transform Siberia itself. After the establishment of the Soviet Union, the use of Siberia as a dumping ground for dissidents vastly increased. Today’s post examines this phenomenon during the Tsarist period, whereas the following post turns to the Gulag of the communist era. The House of the Dead: Siberian Exile Under the Tsars.By Daniel Beer.Allen Lane; 487 pages; &#163;30. To be published in America by Knopf in January. “HERE was a world all its own, unlike anything else,” wrote Fyodor Dostoevsky. Like hundreds of thousands of Russians before him, and many more after, Dostoevsky had been in Siberian exile, banished in 1850 to the “vast prison without a roof” that stretched out beyond the Ural mountains for thousands of miles to the Pacific Ocean. The experience marked him for ever. Siberia, he wrote later, is a “house of the living dead”. It was no metaphor. In 19th-century Russia, to be sentenced to penal labour in the prisons, factories and mines of Siberia was a “pronouncement of absolute annihilation”, writes Daniel Beer in his masterly new history of the tsarist exile system, “The House of the Dead”. For lesser criminals, being cast into one of Siberia’s lonely village settlements was its own kind of death sentence. On a post of plastered bricks in a forest marking the boundary between Siberia and European Russia, exiles trudging by would carve inscriptions. “Farewell life!” read one. Some, like Dostoevsky, might eventually return to European Russia. Most did not. Successive tsars sought to purge the Russian state of unwanted elements. Later, as Enlightenment ideas of penal reform gained prominence, rehabilitation jostled with retribution for primacy. But the penal bureaucracy could not cope. The number of exiles exploded over the course of the 19th century, as an ever greater number of activities were criminalised. A century of rebellions, from the Decembrist uprising in 1825 to the revolution of 1905, ensured that a steady supply of political dissidents were carted across the Urals by a progressively more paranoid state. The ideals of enlightened despotism—always somewhat illusory—were swept away. Exiles re-emerged—if they ever did—sickly, brutalised and often violently criminal. In the Russian imagination, the land beyond the Urals was not just a site of damnation, but a terra nullius for cultivation and annexation to the needs of the imperial state. Siberia, Mr Beer writes, was both “Russia’s heart of darkness and a world of opportunity and prosperity”. Exile was from the outset a colonial as much as a penal project. Women—idealised as “frontier domesticators”—were coerced into following their husbands into exile to establish a stable population of penal colonists. Mines, factories, and later grand infrastructure projects such as the trans-Siberian railway were to be manned by productive, hardy labourers, harvesting Siberia’s natural riches while rehabilitating themselves. But in this, too, the system failed utterly. Unlike Britain’s comparable system of penal colonisation in Australia, the tsars never brought prosperity to Siberia. Fugitives and vagabonds ravaged the countryside, visiting terror on the free peasantry, Siberia’s real colonists. A continental prison became Russia’s “Wild East”. In the end, the open-air prison of the tsarist autocracy collapsed under the weight of its own contradictions. The exiled and indigenous populations were engaged in low-level civil war, with resentful Siberian townsfolk up in arms protesting the presence of exiles thrust on them by the state. A land intended as political quarantine became a crucible of revolution. And modernisation—above all the arrival of the railway—ultimately turned the whole concept of banishment into an absurd anachronism. With revolution in 1917, the system simply imploded. But it never really disappeared. The tsars’ successors, the Soviets, proclaimed lofty ideals but in governing such a vast land they, too, became consumed by the tyrannic paranoia that plagued their forebears. Out of the ashes of the old system rose a new one, the gulag, even more fearsome than what it replaced. Mr Beer’s book makes a compelling case for placing Siberia right at the centre of 19th-century Russian—and, indeed, European—history. But for students of Soviet and even post-Soviet Russia it holds lessons, too. Many of the country’s modern pathologies can be traced back to this grand tsarist experiment—to its tensions, its traumas and its abject failures. It may possibly have been coincidence that President Vladimir Putin’s new appointment was announced on August 19, the 25th anniversary of the coup which led to the collapse of the USSR. The news could not have been more indicative of Russia’s slide into its Soviet past. Vedomosti quotes an unnamed person “close to the current management of the Education Ministry” as calling Vasilyeva’s appointment a “spit in the face for modernization” with Vasilyeva described as an arch conservative who is in favour of prioritizing religious education. In the one sphere, he adds, where the need had been understood for international cooperation and global competitiveness, the country seems to be moving towards isolation. The same source assumes that under Vasilyeva, there will be some kind of Orthodox Christian education throughout all school levels. One of the main projects, Kommersant wrote back in 2013, was an exhibition entitled ‘Orthodox Rus. The Romanovs’. This presented Russia and the Romanov dynasty as facing and conquering all kinds of internal and external enemies. The Decembrists, who were always viewed as heroic champions of freedom and progress are claimed to have been planning to “destroy the Tsar’s family and divide the country into several states” and to have been ready to subject Russia to “bloody chaos”. The video entitled ‘Russia from 1917 to our times’ which ends the exhibition concludes with “the revival of Russia with Putin and the Patriarch” [Patriarch Kirill from the Russian Orthodox Church]. The department was supposed to come up with a concept framework for patriotic education, with this and the task of producing a single history textbook were given priority. Kommersant reported that the concept for this textbook had long been written, but that it still aroused controversy. A couple of weeks earlier, it wrote, Vasilyeva had given a lecture to members of the ruling United Russia party. According to a person present, Vasilyeva had made in clear that Stalin, for all his failings, had been “a blessing for the state” [государственное благо] since on the eve of the War, she claimed, he had engaged in uniting the nation, had reinstated the heroes of pre-revolutionary Russia and promoted the Russian language and literature, with this essentially making it possible to win the War. The Bolsheviks on the other hand had being about dividing the nation, destroying statehood and national ties. This has been widely quoted, although it cannot, in fact, be verified. Other assertions, however, can be. It is not in dispute that Vasilyeva maintains that the Bolsheviks rejected history prior to 1917, and that from then until 1934, the term ‘patriotism’, and the understanding of it, were lost altogether. “In the past we couldn’t have a Fatherland, but now that we have overthrown capitalism, and we have people’s rule, we have a Fatherland, and we will defend its independence”. According to Vasilyeva, it was then in 1931, that the concepts of Fatherland and patriotism were ‘rehabilitated’, with this “returning the Fatherland as a synonym of pre-revolutionary Russia”. Then came 1991, and the collapse of the Soviet Union which Putin has claimed was the “greatest geopolitical catastrophe of the twentieth century”. Vasilyeva also clearly condemns the changes 1991 brought, claiming that the “same experiment as in 1917 was repeated”. Both of these developments saw attempts to wipe out history, she alleges, an attempt “to blacken the past, to try to expunge tradition from the public consciousness. People again stopped speaking about ‘patriotism’. Vedomosti gave a link to this address with an apparent quote that the estimated number of victims of the Terror is much exaggerated. No, Vasilyeva did not use those words, however her apologists should be less ingenuous. Vasilyeva speaks of how Vitaly Korotych’s Ogonyok magazine came out every Wednesday, and talks of “the myths” created in that journal, saying that if you counted up the number of victims, there would be nobody left. The implication is clear that these are stories that are exaggerated, by people who were rejecting the ‘Fatherland’s history’ and who are not ‘patriotic’. Ogonyok was particularly important in those first years of perestroika and after 1991 in publishing the truth about the Terror. Local branches of the Memorial Society also helped uncover the truth about the terrible crimes committed. Most importantly, they made it possible for huge numbers of Russians, Ukrainians and people from the other Soviet republics to finally learn how their parents or grandparents had died. Vasilyeva’s academic interests, starting from her PhD thesis, have focused on the history of the Russian Orthodox Church. She appears to seriously contend that the revival of the Orthodox Church after Bolshevik repression began from 1931, with this once again viewed as thanks to Stalin. Since then there has been an effective ‘rehabilitation’ of the dictator, not his victims, and serious distortion of historical fact, especially about the Second World War. Human rights lawyer Ivan Pavlov recently wrote about how common it is to find portraits of Stalin in the offices of investigators, FSB officers, etc. The ‘positive moves’ Putin spoke of have resulted in people being prosecuted for telling the truth about, for example, the Soviet Union’s invasion of Poland in September 1939 and the Molotov-Ribbentrop Pact. In July 2015, as a new Stalin museum and monument were unveiled in Tver, an article was published by Russia’s Culture Minister Vladimir Medinsky in which he effectively defended Stalin’s role in the country’s history. All of this is coinciding with measures aimed at concealing information about Stalin’s crimes. The notorious Perm 36 Labour Camp which had provided vital information about the GULAG was temporarily closed, then opened effectively eulogising those who administered the repression. The archives of all the secret police [officially ’state security’] bodies (Cheka, NKVD, KGB, etc.) are now to remain classified as secret for another 30 years. This includes the vast bulk of material regarding the Great Terror of 1937-1938, which Russia’s new Education Minister recently suggested was not nearly as bad as unpatriotic individuals make out. “HE WHO controls the past controls the future. He who controls the present controls the past,” George Orwell wrote in “1984”. As Russia’s politics grows more Orwellian, the fight over its past is heating up. The Kremlin’s latest target is Memorial, the country’s most respected human-rights group, set up in the 1980s to commemorate victims of Stalin’s terror. The event has been held annually for ten years, but Arseny Roginsky, Memorial’s chairman, said he had never seen so many people. Ordinary Muscovites kept arriving from 10am until 10pm, undeterred by rain and snow. The names they managed to read were a drop in the bucket of Stalin’s terror. In the peak years of 1937 and 1938, according to Memorial’s figures, at least 30,000 people were executed in Moscow, and 700,000 throughout the country. Memorial was perhaps the most successful civic institution created during Mikhail Gorbachev’s perestroika reforms. Among the founders was Andrei Sakharov, the Nobel Prize-winning physicist and human-rights activist. Another member of the original group was Mr Roginsky, a historian jailed in 1981 for publishing a samizdat almanac entitled Pamyat (“Memory”). By the time of his release in 1985, the word pamyat had become the name of an anti-Semitic nationalist movement. Mr Roginsky’s group ended up adopting the foreign-sounding name “Memorial”. In the wars in Chechnya beginning in the 1990s, Memorial investigated and denounced abuses by the Russian army, including murdering civilians and torturing detainees. Journalists came to rely on the group for information. Its human-rights activists were constantly under pressure; some, including Natalia Estemirova, lost their lives. But until recently, the group was allowed to pursue its historical activities untouched. No longer. Last month the government declared Memorial a “foreign agent”—once a Stalinist term for traitors, now a legal classification intended to throttle troublesome civil-society groups. The foreign-agents law was introduced in 2012, at the outset of Vladimir Putin’s third presidential term. It required any organisation receiving money from abroad and engaging in “political activity” to register. At first, none did. The issue was not the money—charities with foreign donors were happy to acknowledge them—but the definition of “political activity”. “We understand political activity as taking part in a competition for political power,” says Mr Roginsky. But under the Kremlin’s definition, any attempt to shape public opinion or influence government policy was “political activity”. In the case of Memorial this included statements objecting to the war in Ukraine and the killing of Boris Nemtsov, an opposition leader; and opposing the law on foreign agents. Memorial must now label all of its publications—including lists of Stalin’s victims—as the work of a foreign agent. This will put pressure on anyone who comes into contact with the group, such as the thousands of teachers and schoolchildren from remote parts of the country who had participated in its education projects. That the Kremlin has struck against Memorial now is no surprise. In Mr Putin’s third presidential term, control over Russia’s history has become as important as control over television, oil and gas were in his first two. Unable to deliver economic growth, the Kremlin needs to cook up reasons to keep the population in a constant state of mobilisation against external threats. The way the propagandists tell it, Russia is surrounded by enemies and can only be defended by Mr Putin. The past is reshaped to fit this story. The second world war is presented as a Russian victory over the West; the government has commissioned new history books that present the Molotov-Ribbentrop pact to carve up Poland between the Soviet and Nazi regimes as a self-defence measure.Even national security organs are caught up in the struggle over the past. According to Kommersant, a daily, a recent meeting of Russia’s security council focused on measures to prevent the “falsification” of history by foreign states and international organisations. It identified six sensitive historical issues, including the ethnic policy of the Russian empire, Russia’s role in defeating fascism in the second world war, and “political crises” (read: Soviet crackdowns and invasions) in East Germany, Hungary and Czechoslovakia. Russian liberals are not surrendering their history easily. The more pressure the state applies to Memorial, the stronger is the counter-reaction. The past few years have seen the birth of a grassroots movement calling itself “last address”. Volunteers erect plaques at the final known addresses of those who were arrested in the Stalin years and never returned. Although supported by Memorial, it has no formal organisation that can be shut down. Moscow has taken great pride in the fact that the number of Russians incarcerated in its penal system has fallen in recent years, but it has not stressed two current shortcomings of the system: the number of prisoners per 100,000 (434) remains vastly higher than most countries and the number of recidivists has doubled over the last decade. Nor have regime media outlets pointed out that current proposals for reform instead of making things better will lead to a situation in which Russia’s prisons “will very much resemble a renewed variant of the GULAG,” according to Aleksey Kozlov and Olga Romanova of Novaya gazeta. The first two are important, but the third is far more significant than many think. If one counts not only the number of Russians who have passed through the prison system but also their families, friends, police, court officials and jailers, “almost half of the population of Russia is one way or another connected to prison,” Kozlov and Romanova say. “And what is the prison teaching them at present? It is teaching them to lie and to conform. To give bribes to get out early … to avoid contradicting the authorities and to avoid showing any initiative and to be a cog in the system.” And it is also teaching those who go through it to have contempt for the rules and the rulers. “More than that,” they continue, “besides faith in the state and in other people, prison also takes away from the individual his future, that which he could have after being freed.” And it does nothing to help him in that direction while incarcerated, having failed to provide prisoners with any useful training or habits for life outside the walls. Prison officials say that what they do in the camps is because there is no other way to establish order. “But this isn’t the case,” the journalists say. What is needed for order is a complex system of infrastructure and rules that promote different outcomes than the ones being promoted at present. Those who work are paid so little that they have to turn to criminal authorities within the jails for the most basic needs. But that pattern means that they are quickly recruited into the ranks of those who commit more serious and violent crimes. There was some progress against this practice in 2011 when first timers and recidivists were separated. But little else. Under the proposed changes, prisoners will lose control over where they are sent – often distant from their families – what they are employed to work on and how much they will receive. Moreover, the already inadequate medical care the prisoners now receive will become even worse. And such an arrangement just as it did earlier will cast a dark shadow on Russia’s future, quite possibly making it impossible for Russia to reform and at the very least placing burdens on it that will add to the difficulties its citizens now must bear. Historian Yuri Dmitriev, a man who devoted his life to bringing to light the executed victims of the Soviet regime, was put on trial in Russia’s Petrozavodsk on June 1. The events that have brought him to trial took place 80 years ago in a forest near Belomorkanal, a 141-mile-long canal connecting the White Sea with the Baltic Sea. Tens of thousands of Gulag prisoners were forced to build the canal; thousands died of malnutrition and exhaustion. Roman Romanov, the director of the GULAG History Museum in Moscow (About The Museum | Gulag | Museum on Communism), says that one of his researchers, Sergey Prudovsky has discovered that in September 2014, a classified order went out to destroy card files on GULAG victims, making the use of more general archives far more difficult if not impossible. He made that declaration in a letter to Mikhail Fedotov, a Putin advisor, that Kommersant reported. Prudovsky for his part said that the total number of repressed persons under Stalin is unknown, but in 1937-1938, there were more than 1.7 million political arrests. Commenting on this report, Igor Eidman, a Russian observer for Deutsche Welle, says that the destruction of Stalin-era documents in 2014 shows how much the Putin regime has become like a criminal organization down to the pettiest of details. Today, Russians of good will paused to remember those who had suffered and died in Stalins GULAG. This commemoration took many forms but one of the most significant risks being lost: a new map of The GULAG in Moscow shows that Stalins camps and torture places were not somewhere far away as some imagine but everywhere. Such maps, which are only beginning to be prepared, are important for two reasons. On the one hand, they are a reminder of the fact that the GULAG wasnt some distant phenomenon, which many people could easily ignore if they just went about their business, but rather something embedded in their lives regardless of where they lived. And on the other, they suggest that just as the prisons were nearby, so too were the investigators, the sham courts, and the jailers. They too were part of the ordinary scene of life in Stalins Soviet Union and just as some of the victims and their descendants have survived, so too have many of them.